Sunday April 27th 1879 It was a splendid day. I went to church in the evening and devoted all the afternoon to letter writing. I wrote to Chambers and Lillie Campbell, John and Hatt went to Aunty Walkers Sunday April 28th 1879 Hatt did a big washing this forenoon and I cleaned the house. We wound the carpet rags in the afternoon and I cut some more. After supper I went to town with Rob and while he took a ride I waited with Mollie Hand. Tuesday April 29th 1879 I got the ironing by eleven oclock and in the afternoon I made a new sunbonnet. I had a letter from Aunt Mellissa today. 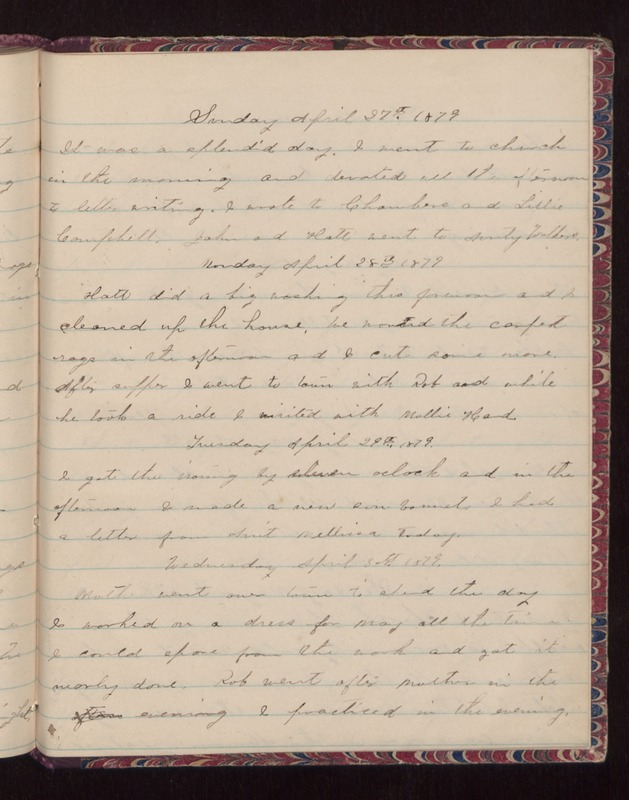 Wednesday April 30th 1879 Mother went over town to spend the day. I worked on a dress for May all the time I could spare from the work and got it nearly done. Rob went after Mother in the evening. I practiced in the evening.